SITTING SAFELY TO WIN SAFELY. The RECARO racing seats for motorsport. PEAK BODY SUPPORT FOR UNPARALLELED RACING PERFORMANCE. Motorsport is the ultimate test of driver and machine: top speeds, centrifugal forces, vibration, jolts, impacts, and maximum Gs. To win, you need unshakable confidence in your car and equipment. One hundred percent. No ifs, ands or buts. A racing car is not comfortable. It’s loud, hard, and stripped to its racing bones. As the key contact area between car and driver, the seat provides critical millisecond-by-millisecond feedback from the chassis, tires, brakes, engine and track surface. It has to be so perfectly tailored that you can forget everything aside from handling the car and winning the race. Every second on the track demands every ounce of your focus and awareness. So what makes the ultimate racing seat? The answer: one that you barely notice, because it supports and cocoons you like a second skin. At RECARO we’re experts in human anatomy – especially the spine. Our racing seats are ergonomically designed to provide outstanding support and protection for your back against all the forces the track can throw at it. A SAFE SEAT IS A SURE WIN. Motor sport is fraught with risks. Drivers face extreme challenges. They need absolute faith in themselves and their equipment. That’s why the top drivers in all the main national and international series choose RECARO racing shells. Supreme protection standards, tough testing regimes, state-of-the-art production processes and 110 years of experience guarantee you the best possible safety margin. RECARO P 1300 GT is designed for vehicles with a slope angle of 8.5°. This is the only way to enable the tilt setting of 3° during installation. EVERY INCH A PREMIUM PRODUCT. Ultra-light carbon. Tough, highly flame-retardant upholstery. Hand-crafted. A RECARO racing seat blends exclusive materials and superb workmanship to create a premium product. ID.-NO. : 7227351 · MARCH 2019 RECARO®, Pole Position® are registered trademarks of RECARO Beteiligungs-GmbH. Seat program for Europe: this is subject to the statutory and legal guidelines applicable in the respective countries. We reserve the right to make changes to the technology, form, color, and design of our products, or discontinue some of our products. We accept no liability for printing errors. 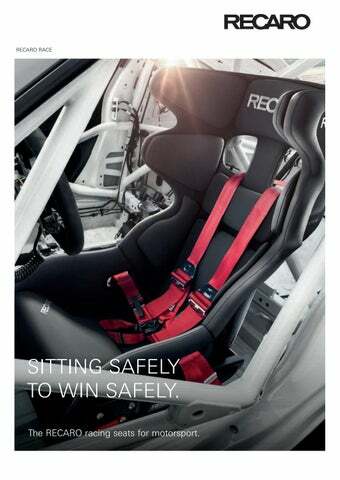 The RECARO racing seats for motorsport.